On February 25, 2017 Wagion Lodge 6 announced the 126th and 127th recipients of the Thunderbird Award. Congratulations to youth recipient Andrew Colebank and adult recipient Clark Guy! 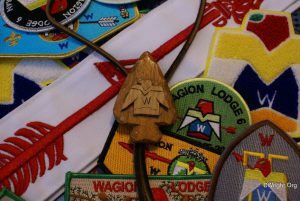 The Thunderbird Award is an award that is unique to Wagion Lodge 6. It was founded in 1957 by Dwayne Welling and was presented to the first recipient, K.T. Williamson. The following year it was presented to seven Arrowmen, including Dwayne Welling, as a committee was established for future selection of the award. Since then, the Thunderbird Award has traditionally been presented to one youth and one adult each year and is recognized by the national Order of the Arrow committee. The Thunderbird Award is primarily an award given by Wagion Lodge 6 to recognize outstanding service rendered in connection with meaningful leadership capacity within Wagion Lodge 6 over an extended period of time. Our recipient was called out into the Order of the Arrow and completed his Ordeal in 2008. He completed his Brotherhood in 2009 and served on the Elangomat Committee. After serving as the Neckerchief Chairman on the Lodge Executive Committee (LEC), he was elected Lodge Secretary, a position which he held from 2012 to 2014. In 2012 our recipient was elected to become a Vigil Honor Member in Wagion Lodge #6. In 2015, he served as the Centennial Celebrations Committee Chairman and also the 2016 Training Chairman. On top of these services, our recipient has consistently presented the Non-Denominational Religious Services at OA Weekends, setting the framework to establish the Religious Services Committee. 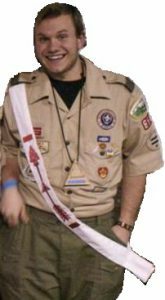 Our youth recipient joined the Scouting movement by becoming a Cub Scout in 2003. He received the Arrow of Light Award in 2007 and crossed over into Boy Scouts. After serving in numerous troop leadership positions, he became an Eagle Scout in 2014. As a member of the Order of the Arrow, our recipient has attended the National Leadership Seminar (NLS) and Lodge Leadership Development Course (LLDC), and OA Prism. to receive the Order of the Arrow Centurion Award. in 2014 as his class Salutatorian. of Pittsburgh for Pre-Medical Neuroscience. In 1962, our recipient completed his Ordeal and became a member of the Order of the Arrow. He sealed his membership in 1963 by becoming a Brotherhood member of the lodge and received the Vigil Honor in 2012. Our recipient has held several adviser positions in the lodge, including Neckerchief and Conservation Adviser. He has been a dues paying member since his induction. Training, Weather and Hazards Training, and National Jamboree Staff Training. 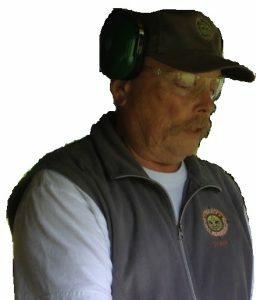 He has served on the Camp Conestoga Camp Staff as both a youth, working in the trading post, and as an adult as the Shooting Sports Director and former Camp Buck Run Director. He has received the Uncle Ben Robinson Award. He is a member of the National Conservation and Environment Task Force of the BSA, and has also served as the National Jamboree Conservation area Coordinator. In 2013, he received the Hornaday Award in recognition for her service in Conservation over an extended period of time. Our recipient graduated from Greensburg Salem High School as member of the Class of 1966. He then studied Human Relations at Missouri Valley College where he was a member of Alpha Sigma Phi, Alpha Phi Omega, and Student Senate. In his professional career, he served as an Agent for the National Park Service, Northeast Region. Congratulations to the 2017 adult and 127th recipient of the Thunderbird Award, Clark Guy!